Steve Bannon might or might not matter any more. Once seen as a self-made populist philosopher (out of Goldman Sachs), hailed for guiding the leaky ship Donald Trump into its White House port, Bannon nowadays faces officials asking about certain inside actions he may or may not know about. He met for 11 hours Tuesday with the House Intelligence Committee. He reportedly said the White House told him not to answer questions about his tenure there. Friction ensued over executive privilege and a subpoena was issued to compel testimony. 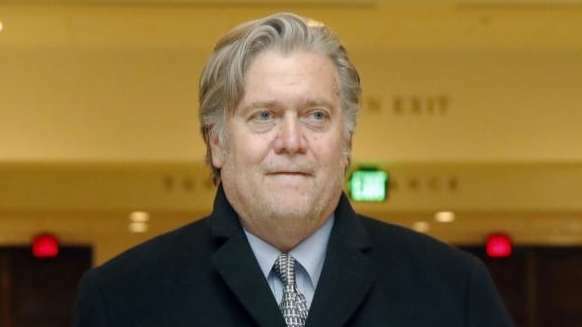 More importantly, Bannon on Wednesday reportedly reached an agreement with special counsel Robert Mueller’s team to be interviewed by prosecutors rather than brought before a grand jury. It might not be part of the probe, but it would be interesting to hear in another forum why Bannon would suggest that. Maybe he meant that members of the Trump team not under his purview carelessly bumbled their way into transgression. That’s bad, but it isn’t “Manchurian Candidate” espionage. Bannon’s seeming lack of discipline and discretion seems to be matched only by that of his former patron, who denounced him in real time and retroactively minimized his role once author Michael Wolff quoted the ex-adviser in public. For a while, Bannon-blaming grew among some D.C. denizens. After Trump’s controversial reaction to the Charlottesville violence last summer, Rep. Peter King said the president should toss Bannon from the White House. Bannon said at the time that as long as Democrats talk about identity politics, they’ll lose against economic nationalism. “I want them to talk about racism every day,” he said. By the time Trump was creating a sensation last week with his vulgar remarks on immigration, however, Bannon was nowhere to be found around the president’s entourage. Trump tweets: End Mueller probe, collusion not a crime, moreSee President Trump's latest noteworthy tweets. Latest news: Trump presidencyGet the latest news on President Donald Trump and his administration.